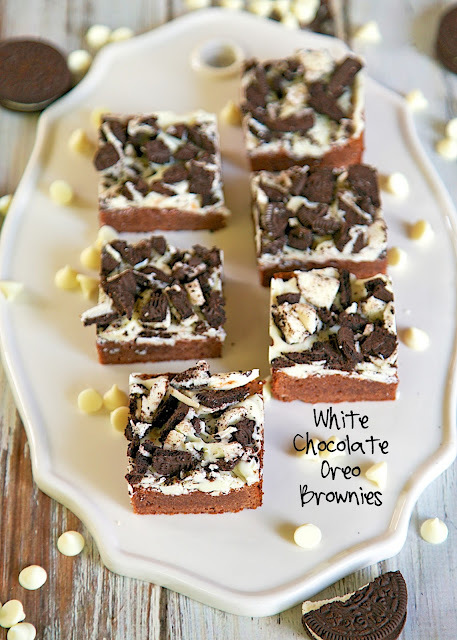 White Chocolate Oreo Brownies Recipe - homemade brownies topped with white chocolate and crushed Oreos - SO good! Recipe from Fat Witch Bakery in NYC. This recipe is from one of my favorite bakeries, Fat Witch Bakery, in NYC. I've made several of their recipes and they are seriously the best. When I saw this recipe I knew I had to make them for Chicken Legs. The brownies are amazing! 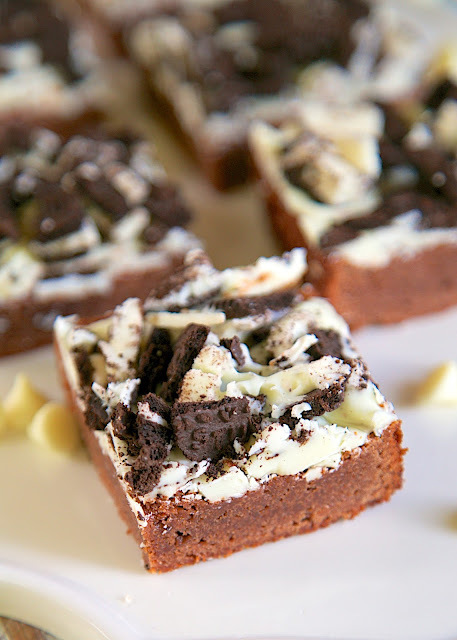 Quick homemade brownie slathered with white chocolate and crushed Oreos. YUM! I did make a couple of small changes to the recipe. I doubled the white chocolate and used Double Stuf Oreos. These are so easy to make and taste great slightly warm with a scoop of vanilla or chocolate chip ice cream! Preheat oven to 350 degrees. Lightly grease a 9x9-inch pan with cooking spray. Set aside. In a small saucepan over low heat, melt butter and chocolate chips until almost melted. Remove from heat and stir until smooth. Allow to cool for 10 minutes. Whisk together eggs, sugar and vanilla. Stir into cooled chocolate. Stir in flour, just until incorporated. Spread batter into prepared pan. Bake for 30 to 35 minutes. Cool in pan on a rack for 30 minutes. Melt the white chocolate chips in the microwave on medium power in 30 second intervals. Spread melted white chocolate over cooled brownies. Immediately top with crushed Oreos. Refrigerate brownies until white chocolate is firm. Cut into 16 squares.